Arts venues are obligated to provide “effective communication” to people who are deaf and hard of hearing under the Americans with Disabilities Act, Title III. How this effective communication should be provided, however, is not specified. Although it seems bewildering to have few guidelines for compliance with a federal law, it is actually to the benefit of the individual arts venue. One size does not fit all. There are several means of serving communities of people with hearing disabilities, and not all of them will reach every audience member or suit the art form presented. 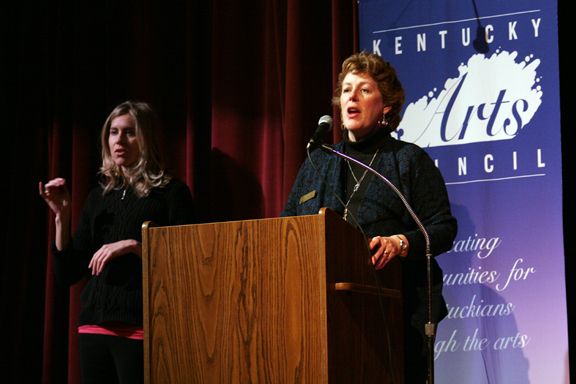 For events that are open to the general public, the Kentucky Arts Council always enlists the help of American Sign Language (ASL) Interpreters. Interpreters can sign for speakers at a podium and dramatic readings and some are even willing to interpret song lyrics. Because we are a state government agency, we can request interpreters through the Kentucky Commission on the Deaf and Hard of Hearing. If you are not a government entity, the commision also maintains a public list of interpreters from across the state. Because ASL interpreters are trained and certified professionals, the prices for their services are standardized. Interpreters charge between $45 and $55 per hour plus mileage. If the event lasts longer than an hour, two interpreters must be present so they can switch. This is where we get to the “one size does not fit all” part. ASL is an artful language. Even audience members who do not understand ASL enjoy watching the interpretation of a speaker’s words. Interpreters provide effective communication for deaf audience members who have studied this language. If you have ASL interpreters at your event, you can advertise it to the deaf community and potentially increase your audience size and diversify its makeup. Unfortunately there are as many or more deaf or hard of hearing people who enjoy attending arts events but do not sign or understand ASL. Consider the aging population who has only just begun to experience hearing loss. ASL is not practical in reaching this group, but assisted listening devices or captioning may be a better option. And you may have special situations where ASL is just not versatile enough , such as when you need to interpret and translate an Italian opera with eight singing parts. My suggestion is to experiment. The next time you have a book reading, a guest speaker, gallery talk, awards ceremony or other arts event, make sure the budget includes money for one or two ASL interpreters; advertise the event to groups or centers that support deaf and hard of hearing communities; use the universal symbol for ASL on publicity materials; and see if your efforts have a positive effect on the mood, attendance and dynamics of your audience. And share your observations with us.